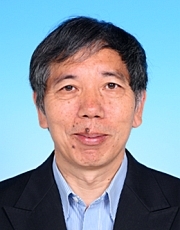 Prof Guochen Jia received his PhD degree in 1989 from The Ohio State University with the supervision of Profs Devon Meek and Andrew Wojcicki. After carrying out postdoctoral work with Prof Robert H. Morris at University of Toronto and with Prof Richard J. Puddephatt at The University of Western Ontario, he joined The Hong Kong University of Science and Technology in 1992 as an Assistant Professor. He was promoted to an Associate Professor in 1998, and to a full Professor in 2005. He is now a Chair Professor of Chemistry at The Hong Kong University of Science and Technology. Prof Jia's research involves the design, synthesis, and characterization of inorganic and organometallic compounds. Current research projects include: (1) organometallic chemistry of hydride, carbene, carbyne, metallabenzyne and metallabenzene complexes, (2) design and synthesis of ligands and metal complexes with emphasis on those applicability to catalysis, (3) synthesis and characterization of inorganic and organometallic compounds with useful material properties, and (4) green chemistry and homogeneous catalysis.